That’s how it was last Sunday, when Tottenham Hotspur beat QPR 4-0 at home. It was exactly the sort of exciting, exhilarating stuff I’d been waiting for all through the summer break. And then on top of all those good things, came a bit of extra goodness – quite unexpected – at half time. I’d got myself a ticket on the Shelf Side – perfectly positioned, as it happened, to see the first three goals go in, close-up. There had been no tickets left in the Park Lane, where I usually go. Anyway, it was a great view and I found myself with a friendly bunch of fellow Spurs fans, all longstanding season ticket holders. Half time comes along and we are all happy, three goals up already, and very pleased by what we’ve seen of new manager Mauricio Pochettino’s style of football so far. I’ve got a big grin all over my face, I can feel it. Then one of my neighbours spots a flag, up high in the corner of the Paxton Road end. It’s hard to pick out from where we are, so the woman who spotted it stands on her seat and cranes her neck to make sure. Now I’ve seen plenty of rainbow flags in my time, but I’ve never seen a gay pride flag at the football before. The friendly elderly guy next to me gets a picture of a rainbow flag up on his phone. “Here,” he says, showing me. “Like this.” That’s not the one up there, I thought, you can’t see anything of the stadium. He laughs, because I’m obviously too slow to realise there is no way you are going to get a close-up like that on a phone. What he’s done – to check what a gay pride flag looks like – is google it. And there it is in the picture, a gay pride flag, just like the one in our ground. Confirmed. The second half started shortly afterwards and Adebayor slotted home a glorious fourth, on the break, zinging into the goal at the Paxton Road end where the people with the flag will have had a better view of it. When I got home I found out that the flag in our ground was hung out there by Proud Lilywhites, the Spurs LGBT supporters’ group. Of course, this is just an anecdote. I’m not claiming it’s any kind of scientific survey. 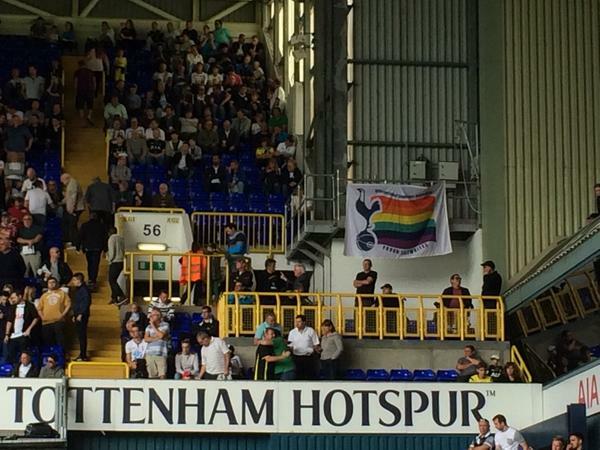 But while it is right to be worried about the level of homophobia in football, it turns out that a random bunch of ordinary football fans – I’d never met any of them before, they are not specially selected from my lefty mates – is happy and pleased to see an LGBT pride flag flying at White Hart Lane. I have a feeling that might be the attitude of many other football fans too: never seen a gay pride flag in the stadium before, but pleased to see it now. On Twitter, the Proud Lilywhites say they are going to put their flag somewhere more central next time. Good on ’em. And come on you Spurs! That said good to see the rainbow brightening up the WFL. as much as i think its a positive statement, i find it very odd that it is one of the only flags allowed inside the stadium and especially one with a political motive. people have had other political flags (I watched a Palestine one a few months back) confiscated, why is this the sole political message endorsed by the club? most of the time you can’t even bring in a spurs flag tbh.